Grewelthorpe: School History. Part 2. TEACHERS and EMPLOYEES AT GREWELTHORPE SCHOOL. Information taken from school log books and minutes of managers meetings. Nov. 1876.WILLIAM MYERS. Temporary school master. Jan. 1877.JOHN MYERS. Head Teacher. Jan 1877. Miss MARY LEATHLEY. Infants teacher. Jan 1877.TOM MIDGLEY. Schoolmaster in charge. Jan 1878.Mr. NATHANIEL GILL. School monitor paid 1/- per week. Jan 1878.JAMES METCALFE. School monitor paid 1/- per week. Mar 1878.ARTHUR G. CORNER. School monitor. Dec. 1878.Mrs. COLDBECK. Sewing teacher. Began to teach the monitors Latin & French. April 1879.JOHN CROOME. Teacher in charge. Replaced Mr Midgely. Mrs. CROOME. Sewing teacher. May 1879.FRANCES SMITH. Monitor to replace N.Gill. F.Smith left village in 1881. JULIA LEATHLEY. School monitor. May 1879. JAMES METCALFE. left for Ripon Cathedral school. May 1881.SUSAN COLDBECK. School monitor. Died 1882. Nov. 1881.JOHN DALBY. New master in charge. Nov 1881.Miss DALBY. Sewing teacher and infant teacher. School became known as GREWELTHORPE NATIONAL SCHOOL. 1882.School managers. Messrs. LEE. GILL. JACKSON. LOFTHOUSE. & vicar. School master provided with a house. Feb 1882.JAMES GILL. New monitor. May 1882. LAWRENCE NICHOLSON. School monitor. July 1882.MISS DALBY. superceded as sewing teacher because work below standard. Aug. 1882.Miss DALE. Sewing teacher and infants teacher. The school managers ordered that all girls would learn sewing every afternoon from 2p.m. – 3.30p.m. Dec 1882.Managers agreed to seek a new Master. Mar 1883.MARMADUKE TAYLOR. Master in charge. Salary £43 per annum. Nov 1883.Mrs. CRABTREE. School cleaner paid £3 per annum. Mr. TAYLOR. criticised by managers for the severity of his discipline. Feb 1888.Mr. TAYLOR’S. wedding day. Children had a days holiday. He was given a gift of £3. 1889.Name changed to GREWELTHORPE C.E. SCHOOL. But this wasn’t popular and school continued to be called NATIONAL SCHOOL. Aug 1889.JAMES METCALFE. A former monitor is now a master of a school in Chesterton, Staffordshire. Dec 1891.Mr TAYLOR. appointed Head master at St. Johns School Bradford. Jan 1892.HENRY WILLIAM STRAINGE. New headmaster. 1893. School managers. Messrs. R.COLDBECK . J.PATTINSON. Jas NICHOLSON.J.GRAINGE. & Vicar. Sep 1893.Made a free school. Abolished the 6d per quarter. Agreed to pay the master £2.10s per annum in lieu of the abolished scholars payments. 1894.MR. GRAINGE. Churchwarden & school manager. April 1894. MR. STRAINGE. Signed the log book saying he was glad that this was his last day at this school. 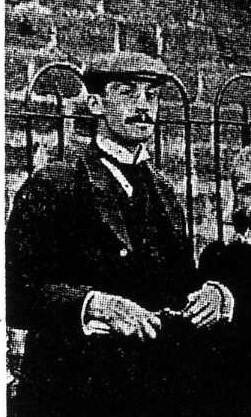 Nov. 1894.SAMUEL HALLIDAY. New Master. Came from Tong school, Drighlington. Resigned as master in Feb 1898. June 1896.MRS SAYERS. Appointed as school cleaner. Successor to MRS. BOLTON. Jan 1898.School Managers. Messrs. BARKER. COLDBECK. GRAINGE. LEATHLEY. HUTTON. Feb 1898.T.E.WILKINSON. Took over as temporary master. Apr. 1898. HENRY FERRIDAY. From Bishop Aukland.Took charge of school. He was given £90 per annum with £2.10s housing allowance. He reported that the children were very backward in Arithmetic and drawing. This master started a reward scheme for children who were good attenders. This is one of the early head teachers. Possibly Mr Ferriday. But not sure. Help please! 18 June 1898.Mr. SAYER. appointed school manager. Dec. 1898.School managers. Rev LISTER. Messrs. HUTTON, GRAINGE, SAYERS. May 1899.MISS DALE. ill with Quinsy. Off for 4 weeks. Her salary is £30 per annum. MISS LEATHLEY. appointed as a temporary teacher. March 1901.Mr.FERRIDAY. left school as master. The following advert was placed in the Yorkshire Post & Schoolmaster. WANTED. CERTIFIED MASTER FOR WELL EQUIPPED VILLAGE SCHOOL MIXED. PRESENT AVERAGE ATTENDANCE 61. CHURCHMAN, MUSICAL,APPLY THE VICAR, GREWELTHORPE, Nr. RIPON. Applications received from South Otterington, Haworth & Keighley. March 1901. FREDERICK PICKLES. appointed new master. See picture. April 1901.Mrs. MOORE. school caretaker. Mr. LEES. appointed organising master paid ’1.7s.6d. Sep 1902.Mrs. PICKLES. School cleaner paid 7/6 per quarter. She was expected to find kindling for the school stove. Dec. 1902.Mrs.THWAITES. School cleaner. Paid £5.4s.0d in 1905. She died July 1905. May 1903. Miss DALE. It was noted that she is hard of hearing. July 1903.It was agreed to look for another teacher. Miss GRUNDY. from the village started in September but she left in October as she did not feel equal to the post. Dec 1903.HILDA CRABTREE. a former monitor accepted the post at 5/- per week from Dec 1st to March 31st. However Mr Pickles complained that she was slow and had to be told every little thing. In Sept. Mr Pickles recorded in the log book with regret an act of insubordination from Miss Crabtree. We can only guess at what she said or did. MISS DALE. was given a bonus of £5 in recognition of more than 20 years work in the school. July 1904.School managers. Vicar Rev.F.HEWITT. Messrs. HUTTON. PETER LOFTHOUSE. COLDBECK. CRABTREE & SAYER. July 1905.AMELIA CRABTREE. offered caretaking position. She resigned Jan 1906. Mrs LUCY PICKLES. new school cleaner. Feb 1905 Miss GERTRUDE LEATHLEY. started as a supplementary teacher. Has had no previous experience. Feb 1907.G.H.HEWITT. a pupil teacher. Left in May 1908 after passing his preliminary exams for certificate and also obtaining a 1st class pass in the Oxford Senior local exam with special distinction in drawing, holding the 4th place in all of England in this subject. Sept. 1907. MISS A.DALE. reported as deaf but the managers satisfied with her work..
Oct 1910.Miss HARRIET GOWING. applied for post as teacher. Aug 1912.Miss DOROTHY SENIOR. interviewed for position as assistant mistress. July 1913.Mr. Arthur R. MARTIN. elected as Master. He came from Barnoldswick. A native of Derby. Jan 1915.Miss SENIOR. sick. Mrs ELSIE MARTIN. temporary assistant teacher appointed. Nov 1915. Mr MARTIN. volunteered for military duty but he was turned down. Later he served with the Royal Garrison Artillery . Later he was appointed to Kilnhurst Council School and thence to Mexborough and Darfield in 1939. 1916.Miss SENIOR. left and Mrs MARTIN. appointed as temporary teacher. Feb 1918. Mrs. MARTHA JACKSON. caretaker & cleaner. She died in Dec 1920. Aug 1919.Interviews for new headmaster.Mr.W.H.FLATHER. appointed as temporary head master. Dec 1919.Miss E.ADAMSON. Appointed as assistant teacher for 3 months. She was asked to leave in May 1920. June 1920.Miss A.JACKSON. applied for teaching post. Dec 1920.Mrs. DOBBY. new school cleaner. Mar 1921.Miss M.AUTON. From Thornton Watlass appointed assistant teacher. But when she visited the school she turned down the appointment. Mrs. FLATHER. appointed as a temporary teacher. July 1921.Miss A.WESTERMAN. appointed as teacher. Nov 1921.Miss DALE. Resigned thro’ ill health. She had taught at Grewelthorpe for 39 years and 5 months. Old scholars and friends were invited to a testimonial for her.See picture. Dec 1921.Miss BENNETT. of Delph Oldham appointed to replace Miss Dale. 1923.School managers. Gen.DALTON.Messrs. JOWETT. WESTWOOD, LOFTHOUSE, Mrs BROWN and Rev.BOON. June 1923. Mr. FLATHER. head teacher resigned. Over 50 applications received. 3 invited for interview. Mr. DAVIS. Mr. HEY & Mr. BOOTH. With 2 reserves. Mr. POLLITT & Mr.PEARSON. Mr Hey. was 1st choice but he withdrew and Mr L.W. DAVIS. got the job. Nov 1923.Two teachers were Miss WESTERMAN and Miss BENNETT. June 1925.Miss WESTERMAN. sick with muscular rheumatism. Miss MARION ROBINSON. considered as temp.teacher. Oct. 1925.Mr. L.W.DAVIS. asked to leave. 30 applications received for headship. 3 asked to come for interview. Messrs VERRAL REID & GAWTHORP Mr REID was offered the position. 1926. Mr. REID. got the children interested in gardening. He explained that when he first came to Grewelthorpe there were no flowers about the place. He started to develop a garden and they finished the layout in the Summer of 1929 making 3 rockeries for which the stones had been carried many miles by willing hands. As the children lived in the countryside it was up to the school if possible to train them to appreciate their surroundings and if they would be taught to think and reason they would not be out of place anywhere. Miss Bennett and class of C1928. Girl holding board is Minnie Ashby. Girl far left is Betty Jowett. 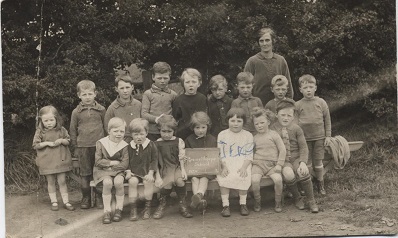 Boy standing 3rd from right is Billy Goundry. [Thanks to Ann Simpson for this photo]. Oct 1931. Miss WESTERMAN. Resigned to get married. She married a Canadian. She was given a gift of a silver fruit stand from the staff and children. Nov 1931. Miss ELSIE E. JOHNSON. offered post as assitant mistress. Sept. 1936. Mrs. ASHBY. School cleaner resigned. 7 applications for the job received. Mrs. ASCOUGH. Mrs. DOBBIN. Mrs. HARTLEY. Miss ROBINSON, Mrs. HOLLAND. Mrs. MacDONALD, & Mrs. SYMMONS. Mrs. ASCOUGH. elected. Sept. 1937. Miss BEATRICE JOWETT. offered post as assitant teacher. Oct 1938. Miss DIXON. Temporary teacher appointed. Jan 1941. Miss BENNETT. teacher since 1921 left thro’ ill health. She received a pension of £36. Sept. 1945. Miss JOWETT. left to be married. She was replaced by Mrs. N. BROWN. who had been teacher at Masham but lived in Grewelthorpe. Jan 1947. Mr. REID. Headmaster since 1925, resigned. Miss. MINNIE JOWETT. appointed headmistress. There was much talk in 1947 about closing Grewelthorpe school and making the village children attend Kirkby Malzeard school. On Thursday 2nd January 1947 there was a meeting in Ripon to outline the County Council’s School Development Plan. Mr Hall moved and Mr J.V.Keighley seconded it and it was agreed to record that Kirkby Malzeard school be so enlarged as to become the centre to take in children from Grewelthorpe as the cost would not be anything like a new school for Grewelthorpe. A copy of this resolution has been sent to the West Riding Education Committee. The Chairman observed that the matter is now in the hands of the Education department. Councillor Trenholme said he understood that the Education Authority was prepared to build a school in Grewelthorpe, but the sub committee had gone one step better and suggested that the school should be built in Kirkby Malzeard. His objection to that scheme was that it would entail children of 5 years having to travel. Many other Councillors supported his comments. It was reported between 1950 & 1954 a new school for Grewelthorpe would cost £13.23,5. 1951. Mrs. RICHARDSON. school caretaker resigned thro’ ill health. Replaced by Mrs. A. CHAMBERLAIN. Feb 1957. The school became a controlled C of E school. The managers ceased to have control. Funds transfered to St. James Church PCC. New managers are Messrs. CLARKSON, ASCOUGH, MYERS, INGHAM, Rev. JONES, and MISS M.JOWETT. School dinner ladies. Date unsure. Frances Leathley. Barbara Fenwick & May Stelling. In the 1960’s the feeling was that the school was too small and attempts should be made to get a new school. The Rev. Gareth Jones, whose wife Mary taught at the school, attended a meeting of the Ripon & District Education sub-committee in Ripon. It was reported in the local press. Rev. Jones was asking when the promised new school for the village as to be built. ‘My wife teaches in the room and she has to climb over desks to get from one group to another. The whole school is terribly inadequate.’ At the end of the 1964/65 school year there would be 26 infants. In the other room 28 children were taught and at the end of the next school year there would be 31. This room measured 31ft by 18ft. ‘All the inspector’s reports have dealt with this lack of space, there is no room for physical education or anything like that.’ He continued ‘Another part of the problem is that 45 children stayed for school dinners. There was no accommodation for this and the children had to eat in the big classroom.’ The board agreed that there was a clear case of over crowding. They discussed putting temporary accommodation for the infants in another building on the playing field. This “temporary” classroom was eventually installed on the playing field with a steep flight of stone steps to reach it. It remained in place as an infants classroom for many years until the village received a new school, in 2003, alongside it. The old school was sold off and made into a private house.